Sustainability-minded warehouse operators have another strong reason to choose electric forklifts over their internal-combustion counterparts. 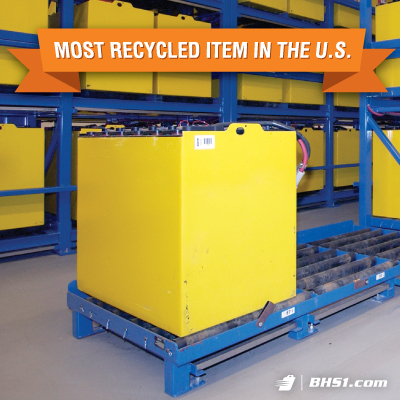 Lead-acid batteries are the most-recycled item in the United States. We already know that lead-acid batteries have a near 100-percent recycling rate. But a 2017 study from Battery Council International and Essential Energy Everyday found that this makes the humble lead-acid battery the most-recycled item in the country. At a distant second, corrugated boxes had a recycling rate of 88.5 percent in 2013, reports the Pew Research Center. That’s still a ways off from that year’s recycling rate for lead-acid batteries, which was 99 percent. Many of these batteries powered essential systems in passenger cars and trucks. But others — with much larger quantities of recyclable components — were used to move electric forklifts through the aisles. The components of a forklift battery are almost all recyclable. Plastic, lead, and electrolyte can all be separated out and moved through their own distinct recycling streams. In fact, recyclers melt the lead from used batteries and fashion it into new plates for the next generation of energy providers. Electrolyte can be neutralized, creating only water, or processed into sodium sulfate. Manufacturers of glass, textiles, and detergents use this material in their production processes. Even the polluted water generated by washing forklift batteries can be neutralized and reused. Fleet owners can even treat wash water themselves with a Wastewater Recycling System or a Recirculation/Neutralization System. Existing recyclers are already equipped to handle the materials derived from used industrial batteries. Strong markets for recycled plastic, lead, and electrolyte are already firmly entrenched. This infrastructure allows battery dealers to funnel used product directly to producers who will ensure that their components go on to power the future of material handling equipment. In many states, recycling lead-acid batteries is required by law. More than 40 states have laws relating to battery recycling or disposal. To learn about battery recycling laws in your state, see this guide from the trade group Battery Council International. Customers care about sustainability, and many major corporations have already committed to green warehousing practices. Electric forklifts don’t boost carbon emissions like internal-combustion trucks, and when batteries reach the end of their service life, virtually all of them are recycled. Along with switching to LED lighting in your facility, running a fleet of electric forklifts is among the most powerful changes you can make to improve sustainability. That’s a difference that will show up on the bottom line — and in the world at large. Desilver, Drew. “Perceptions and realities of recycling vary widely from place to place.” PewResearch. Pew Research Center, 7 Oct. 2016. Web. 13 Mar. 2019. Gooley, Toby. “The basics of battery recycling.” DCVelocity. Agile Business Media, 23 Jul. 2012. Web. 13 Mar. 2019. “Study finds nearly 100 percent recycling rate for lead batteries.” RecyclingToday. GIE Media, 16 Nov. 2017. Web. 13 Mar. 2019.